It’s been raining the last couple of days, making the tot and I a bit ornery. We knew the rain was coming, but it’s so dark in the mornings, causing us all to cuddle deeper under the covers instead of popping out excited about the day ahead. There’s nothing to rush for, so I curl into the bed and wait for my daughter to mumble “good morning” from her room letting me know she’s ready to start the day. After about an hour of rubbing our eyes and figuring things out, we go about our daily routines. The husband heads to work, I sip tea and write stuff, and the tot either goes to preschool or does projects with me. Because of the dark, and somewhat dreary day, I couldn’t help being reminded of when I was teaching high school art and what I would do with a class that was stuck in the doldrums. I’d pop in a movie, shove sketch paper and sticks of charcoal under my students’ noses, and encourage them to doodle while zoning out. Sometimes you just need to do nothing to find creativity. One of my favorite things to pop in the old video player was this documentary of Picasso. The music is a bit funky, Picasso is crazy, his paintings are so simple but amazing, and it’s black and white — which is actually soothing. 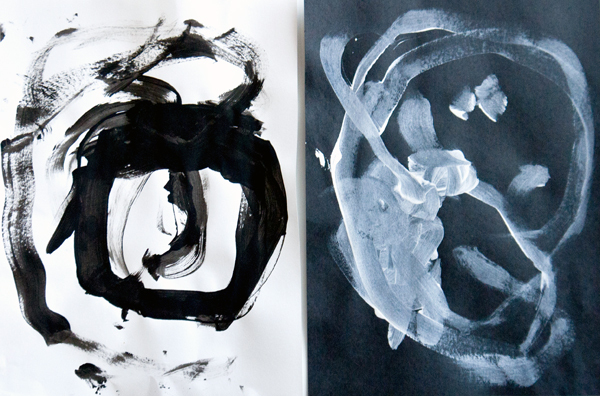 After showing this snippet to my tot, we got out black and white paper and black and white paints. I offered her a sheet of white paper and a selection of paintbrushes ranging in size from big to small, along with black paint, and encouraged her to make interesting lines. This is a great activity for introducing focusing on making long and expressive lines to tots. Your little one really wants to go with her gut and simply scribble, but encouraging her to make shapes, or even attempting to draw a form, makes for an exciting creation. Older kids can paint exaggerated forms with simplistic details, just like Picasso. Once your child is finished, swap the white paper and black paint for a sheet of black paper and the white paint. 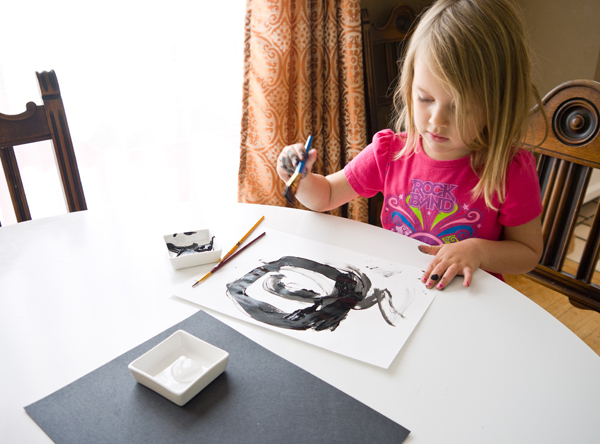 Leave the black painted sheet of white paper within sight and encourage your child to create the same design, but with the white paint on the black paper. Once the paintings are dry, display them side by side to see how they are similar and different. Oooh I love the video you shared for us and I love the idea o going back to the basics of black and white. How fun to explore things in opposites. Fantastic. I think my son will like this too! Thank you so much for joining in with Kids Get Arty! Absolutely beautiful! I love, love this! Great idea!